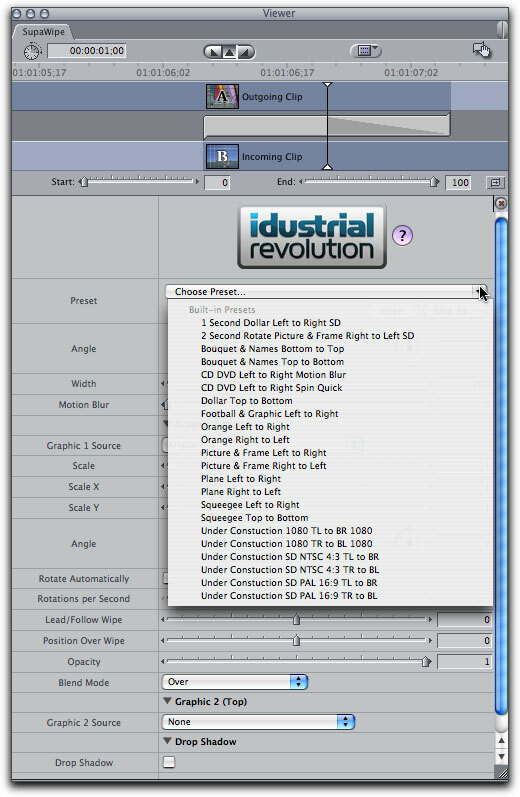 Noise Industries released its latest version of Fx Factory 2.0 in November, 2007. 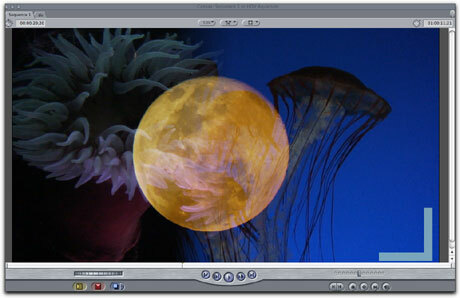 With it came an additional 52 FxFactory plug ins for a total of 122 filters, generators, and transitions. I have used them since version one and have always been pleased with their ease of use and quality. 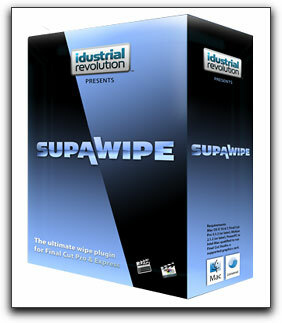 Other sets of plug ins have since become available and this latest, SupaWipes, appears to be worth taking notice of. Wipes have been used as transitions for as long as I can remember. In a sequence, more often then not, they represent the passing of time or a jump to a different location. In feature films they fell out of favor until George Lucas brought them back in a major way in his Star Wars series of epic Science Fiction movies. In order to take advantage of SupaWipe transitions you must have Noise Industries' Fx Factory already installed. Their brief but comprehensive manual says to have OS 10.4.11 or Leopard installed running Final Cut Pro 6.0.2 or higher or Final Cut Express 4. I have SupaWipe now installed on my Mac Book Pro running Leopard and my Mac Pro still running Tiger and have not had any difficulties or crashes. Found in the Transitions section of your Effects tab, one just needs to scroll down to the idustrial revolution bin to find the SupaWipe plug in. 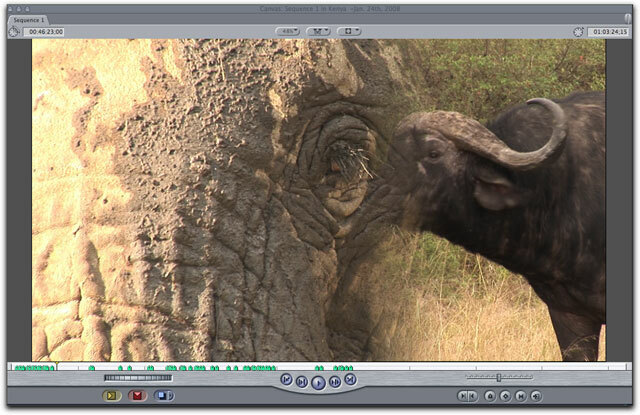 I found it along with my Volumetrix plug ins also produced by idustrial Revolution and reviewed here last year. SupaWipe is not a vast collection of different wipe transitions but rather a single plug in accompanied by a number of preset wipe objects. Multiple sets of wipe options are part of the Supa Wipe package. Parameter controls were easy to navigate. There are several objects that can be used from their stored presets and more than one can be used at a time. For the vacationers among you, a plane moving left to right; right to left or any direction you want serves to bring you from one place to the next. 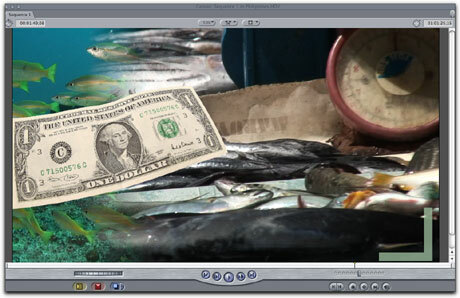 A leading dollar bill could easily be used in any of a number of the political ads we have be inundated with as of late, and then there is the flying, rotating CD/DVD, Soccer ball, or Orange slice that can take you from scene to scene. All the supplied images included in Supa Wipes are high resolution images. Any of these objects can be scaled up or down, moved around the canvas, or have their direction changed all without key framing. In fact, the transition has a full 360-degree orientation and the object can be set to come in before, after or lead the wipe. 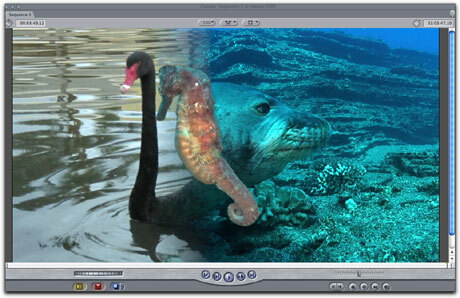 The SupaWipe transitions can be softened to your demands and its' width adjusted as well. I'm still a fan of the soft wipe easily done with Supa Wipe. While any of the supplied, HD resolution images can be adjusted by path and orientation, they are still images and not animations. I do not know why they are not animated, a flying bird, a speeding car perhaps, a swimmer or an animated fish would make it all the more appealing and useful. 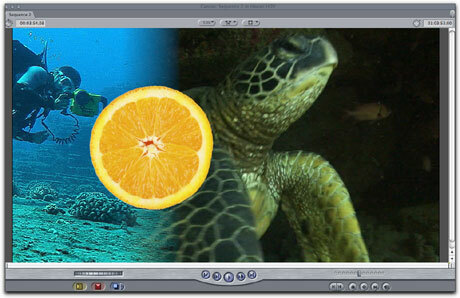 Of course, overuse of any number of transitions other than a simple dissolve or cut can get a bit cheesy. However, in its right place, they can really enhance a production. Most of the supplied stills look pretty good, there's the plane streaking across the screen, the orange slice rolling along, and dollar bill you can kiss goodbye. There's also a black and yellow 'Under Construction' sign, a bouquet of flowers, a cool squeegee, and a soccer ball, which might be useful. A non-descript picture of a bride and groom is available but I can't understand why they would think I would want a picture of a married couple I have never met. Also included are a couple of texts that read 'Jack and Jill' and 'Arsenal v Chelsea. There are no parameter controls where these texts or their colors/fonts can be changed and I am a bit perplexed as to why they are included as well. Of course, you can set the parameter to 'none' which would eliminate the text and you can use an object well to place your own text in. 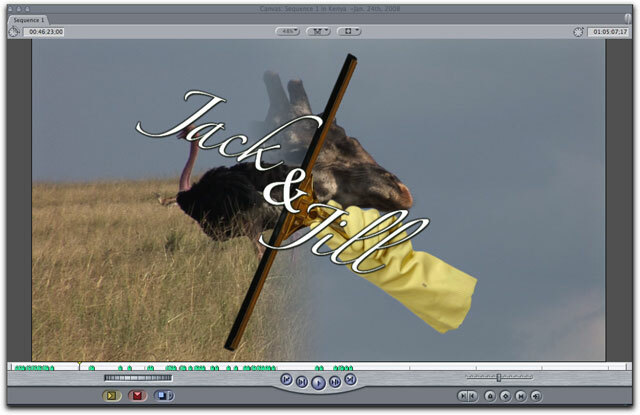 Maybe the ostrich is named Jack and the giraffe is Jill. I'd still like to be able to change the text if I chose to. Using the object well in SupaWipes is where I had a chance to create wipes that were relevant to my own projects. It was easy to do and adjustments were made without much of a fuss. Once done, you can save your customized wipes and retrieve parameter settings as a preset for the next time. Eventually, you will have your own library of wipes and images at your disposal. There is no time lost key framing anything with SupaWipes, it's pretty much automatic. However, the ability to key frame changes in direction and scale can be a valuable thing and a part of me wishes that that had been left in as an option. 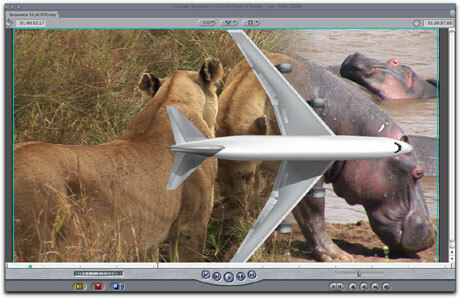 Using the image well allowed me to use my own images and composite modes. My bottom line is that idustrial Revolution's Supa Wipes enables you to create unique and creative wipes without the need for a whole lot of fuss. The supplied graphics are quite good though there are not a whole lot of them. Never the less, you can use your own images via the image well and my guess is that most editors would do just that. The cost of Supa Wipes can easily be made up in the time you save from creating your own wipes, and you can't argue with money saved.